I can not rave enough about this book – if like me you love a bit of the orient when it comes to food, Rick Stein Far Eastern Odyssey is a must have book in the recipe collection, packed full with loads of tasty and Fussy Foodie friendly (with a few tweaks) recipes. I am getting hungry just thinking about it – Rick Stein is a food genius. The book its self is packed full with recipes from Thailand, Vietnam and Malaysia and runs alongside the TV show, which if you havent seen is def worth a look too, it will really give you some inspiration to get cooking. A couple of substitutes to bear in mind for food intolerance’s: Agave Nectar (good when a little sugar is required), and check out Wheat Free Soya Sauce. If you want help tweaking any of the recieps to be friendly for you let me know which recipe you want to give a try and I will send over some tips. 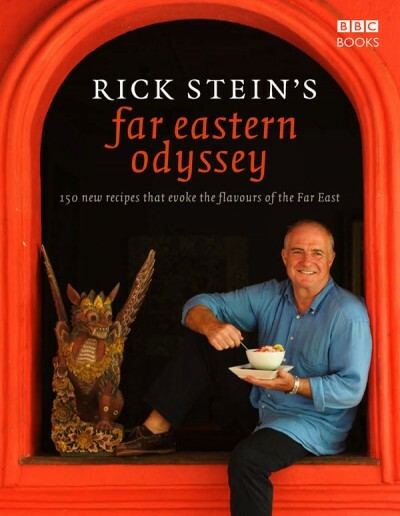 “Rick Stein’s Far Eastern Odyssey is an epic culinary journey along rivers, through jungles and around coastlines. Along the way, Rick visits traditional family-run restaurants, street vendors, floating markets, night markets, fishing villages, and the local cinnamon and rice farmers to learn about the authentic food of the Far East, and to sample the delicious spectrum of exotic flavours. Watch this space for my take on Rick Stein Far Eastern Odyssey recipes including how to make Thai satay sticks with peanut sauce Fussy Foodie style- which are my BBQ favorite. I also adore this book and loved watching the series. Last week I made the first recipe in the book (an amazing Cambodian dish) and I’m actually tempted to work my way through every recipe now!